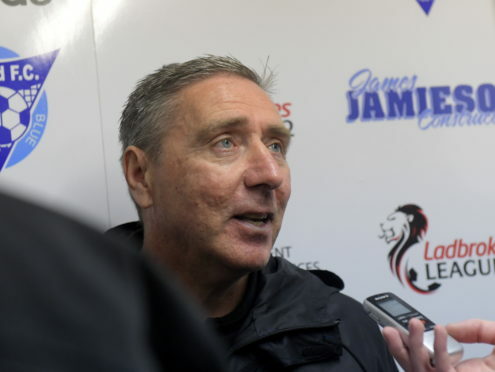 Jim McInally will not allow Peterhead’s injury dramas overshadow their League 2 run-in. Experienced striker Derek Lyle looks set to miss the rest of the season after fracturing his ankle in the 2-0 defeat to Berwick Rangers on Tuesday night, while Simon Ferry’s long-standing back problem has flared up again and Jack Leitch has suffered ankle ligament damage. Rory McAllister’s status ahead of the Edinburgh City game is uncertain as his wife is expecting a baby, which prevented him travelling to Berwick and may keep him out of the trip to the capital. McInally is gutted for Lyle, who had cancelled a family holiday to play at Shielfield Park only to suffer the season-ending blow. He said: “He was due to go to Tenerife last Sunday but with the Berwick game being postponed on the Saturday, he cancelled the flights to play in the game on Tuesday. It shows he’s a total professional but I’m gutted for him, as his season is probably finished. The defeat to Berwick saw the Blue Toon miss the chance to stretch their lead at the top to eight points, with it being their game in hand over City. The two sides have juked it out at the top of League 2 for the majority of the season but it is Peterhead who hold the advantage in the climax of the campaign, holding a five-point lead with seven games to go. McInally added: “I hate losing but when I look at the league table – I don’t know if it’s after last year’s experience but I can’t be anything but positive. Last year I was coming off and asking what the Montrose score was and I would rather be where we are now. If we win on Saturday we’re in a fantastic position. Jamie Stevenson is in line to return to the squad.